I’ll admit to being more than a little obsessed with Angry Birds. I’ve got three versions on my iPhone right now (Original, Seasons and Rio) and I get seriously psyched when I check my apps and find there are a few new precious updates available to me! Woot Woot! And then, I may or may not drop everything until I get at least two stars on all the levels. God bless Rovio, the inventors of those crazy birds. In thanks, I’ve decided to provide them a little idea. It’s fun, it’s exciting and (best of all) in keeping with current events. And this bird is pissed. 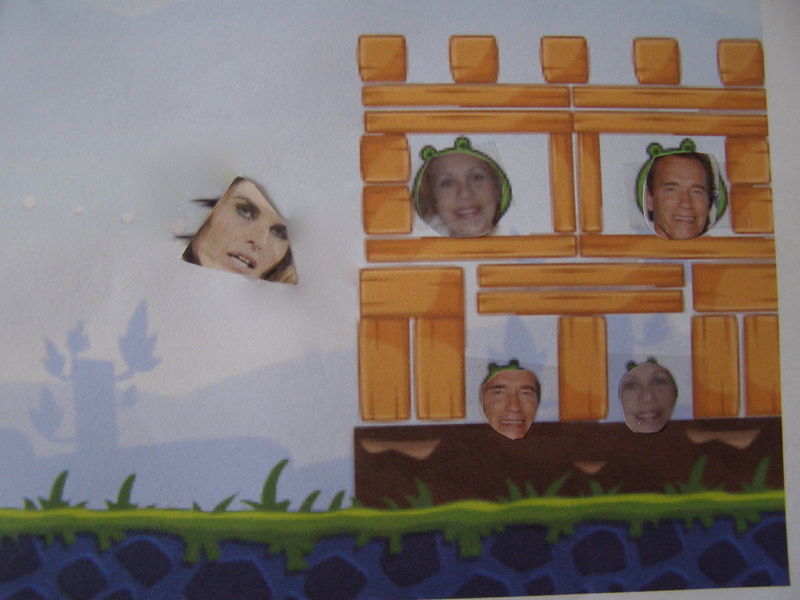 Maria is backed up by bonus birds in the forms of Sargent Shriver, Gloria Allred and Oprah. When you tap the screen, she splits into approximately 173 members of the Kennedy clan. If you take out the maid, you get 500 points. If you take out Arnold you get about 7 million a year plus child support. I don’t know…is 7 mill a year worth the humiliation of a husband who sleeps with the help??? I. LOVE. YOU. And not in the lesbian stalker way. just added YOU to my google reader, too. thanks for the nice words. now, go clean up some dog hair. you are hilarious. and not just this post, but all of them. That is hilarious! I would definitely play it, especially after my friends and I called him a pig yesterday. Love your site, even tho’ it makes me miss Massachusetts! I love angry birds too but I never get to play it b/c the 6 yr old is constantly draining my phone playing it. I literally laughed out loud reading this. I’m just as obsessed with Angry Birds as you are. I’ve got the same three versions my my iPod Touch and will not stop until I have the 2 stars or the star/fruit. Don’t you just love that Rio has a golden fruit in almost every level? Good bye sleep and productivity. Hello dying battery and green pigs. What a hoot! I have no idea what Angry Birds are (is? ), but I gather it is a video game (perhaps? ), but I totally got the play on it with Maria, which is the important part. You could sell your new video game and make a fortune. Wait…would you still keep blogging? Love it! I’d like a customizable version where I could upload the faces of my exes (and their new significant others). Now, that would be an addicting game.